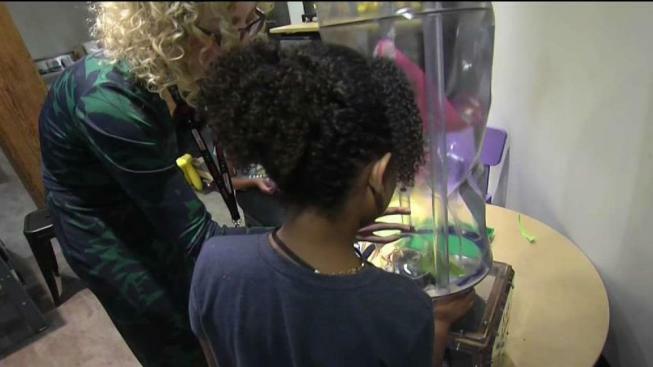 A transformational grant from NBC Universal allowed the Boston Children's Museum to open the "STEAM" studio. A transformative grant for the Boston Children’s Museum has allowed the museum to open a room dedicated to fostering creativity in science, technology and the arts. “We have a laser cutter, we have a 3D printer, we have a vinyl cutter. We have a lot of interesting equipment that they probably wouldn’t have used before,” President and CEO Carol Charnow said. The new “STEAM” room -- or Science, Technology, Arts, Engineering and Math studio -- at the Boston Children’s Museum embodies the mission of imagination. “Being creative, being imaginative and being curious. We focus on developing those skills in kids in really fun ways. That’s exactly what this whole room is about,” Senior Director Melissa Higgins said. Sisters Illyana and Niyah tried out the wind tunnel, with the idea being to design an object that floats. Failure is an option in the STEAM room, though, because Higgins says they can learn from anything that might be a failure and that’s all part of the process. The museum relies on grants to create special exhibits like the STEAM studio, where innovative professionals can engage kids. A grant from NBC Universal, NBC10 Boston’s parent company, made the STEAM room a reality. The tech kitchen is now open on the weekends, but there are programs all week. In the last few months, dozens of tech experts have dropped by to help mold young minds with high and low tech tools. The future for STEAM at the Children’s Museum is bright. The “STEAM team” is always looking for ideas for more creative projects to have in the studio and they hope to see it grow, so they encourage anyone who visits and has any ideas to let them know.